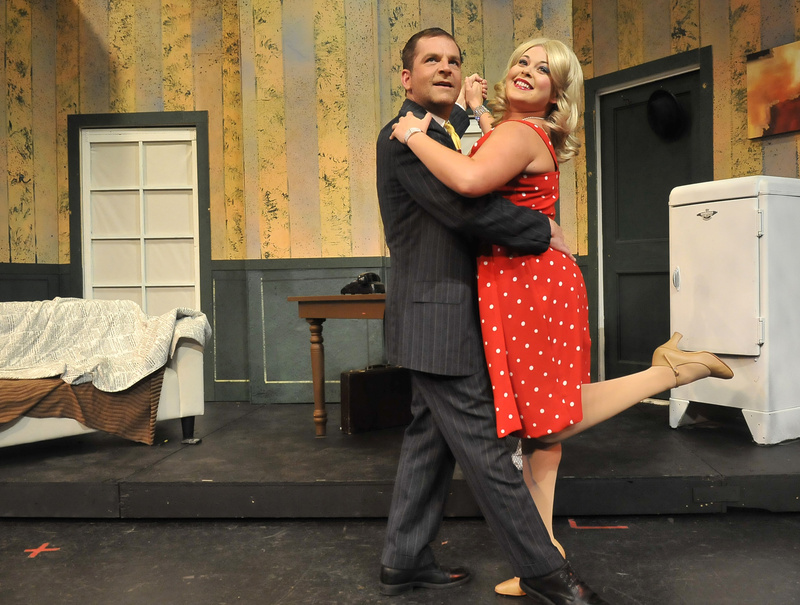 “The Producers,” reviewed Friday, continues through Oct. 21 on Spokane Civic Theatre’s Main Stage. Tickets: (509) 325-2507 or TicketsWest outlets, (800) 325-SEAT. Opening Spokane Civic Theatre’s 66th season, director Marianne McLaughlin, choreographer Ali Wade and music director Benjamin Bentler – the same creative team behind last season’s “The Best Little Whorehouse in Texas” – present a scaled-down version of the Broadway smash that manages to preserve much of the show’s original, ridiculous flavor. Those familiar with Brooks’ repertoire (“Spaceballs,” “Blazing Saddles,” “Young Frankenstein,” etc.) already know the comic prides himself on being as politically incorrect as possible. And this show is certainly no exception; its show-stopping number “Springtime for Hitler” features an army of singing and tap-dancing Nazi soldiers paying homage to the Third Reich. And its abundance of other ethnic, sexual and gender stereotypes are guaranteed to humorously offend just about everyone. Based on Brooks’ 1968 movie of the same name, “The Producers” follows washed-up Broadway producer Max Bialystock (Jerry Sciarrio) who teams up with mild-mannered accountant Leo Bloom (Mark Pleasant) to devise a profitable scheme to produce the worst show in Broadway history. Sciarrio and Pleasant manage their roles well and make an amusing duo; their performances are similar to Nathan Lane’s and Matthew Broderick’s sardonic portrayals on Broadway and are significantly milder than Zero Mostel’s and Gene Wilder’s more slapstick portrayals in the original film. As Max, Sciarrio portrays a shameless con man who woos little old ladies into backing his shows. As cowardly and infantile Leo, Pleasant clings to a blue blankie whenever his neurosis gets the better of him. They are met by a hilarious motley crew of supporting characters, including Dan McKeever as brawny, psychotic Nazi playwright Franz Liebkind – equipped with a helmet, lederhosen and an army of rooftop pigeons; cross-dressing show director Roger De Bris (Lance Babbitt); his “common law assistant,” Carmen (Taylor Pedroza); and Swedish leading lady/buxom blonde, Ulla (Angela Pierson). An ensemble of elderly ladies dancing with walkers and side-splitting cameo appearances by character actress Kathie Doyle-Lipe served as other highlights of the show, as well as Jan Wanless’ costumes and David Baker’s set design in Act Two.